Happy Thursday everyone, I hope you are all having a fantastic week. I apologize for the delay in posting this week. They say the road is paved with good intentions and I was hoping to get this out earlier but then life happens and you learn to just go with the flow. But here we are! 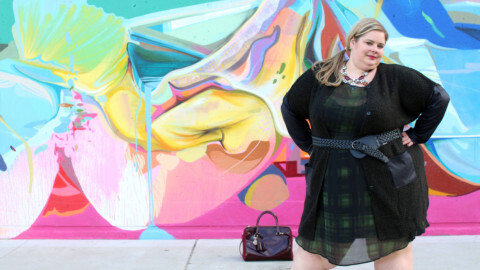 So I am really excited about this post because it features one of my absolute fave brands, ELOQUII and a look that I thought I wasn’t sure I was ever going to have in my wardrobe again – the Power Suit. When I saw this jacket show up in my inbox I immediately clicked the link and made it mine. Now that I have gotten to try several jackets from ELOQUII I have learned that when they bring something out in a peplum shape that I should grab it. And then when I saw that it had a matching skirt I have to admit I got a little nostalgic and bought it too. So why is this suit nostalgic for me? Because it reminds me of when I first started working full time back in the fall of 1999. I had just finished my Masters degree, written my CA exams and embarked on this new journey as a professional. At the time I had lost some weight and I had just finished school so I needed a new work wardrobe. And in 1999 business casual wasn’t really a thing and suits were the expectation. And no matter how much I weigh, finding a suit that fits me well has always been a challenge. I am not very broad in the shoulders but I have a big booty and wide hips so jackets are and always will be a struggle. Thankfully back then, styles were much more boxy so it was a bit easier. But I do remember finding this one navy suit that fit like a dream. When I put it on I felt like I could take on the world and it was symbolic of achieving my goals. So whenever I had a special meeting, I always wore that suit. As I have mentioned before my new firm is much more conservative and the men actually wear suits and ties. As a woman I am very fortunate because we have a lot more flexibility in what we can wear. But I firmly believe that there is nothing better than a man in a well tailored suit. So I have been kind of envious that I don’t have as many options, especially being in a senior management position. This suit has not only given me that option but it has reminded me that I do want to be able to wear a power suit if I choose. I want to experience how I felt back when I was a young professional with huge ambition and serious goals to achieve on this next chapter in my career. As accountants in public practice a major milestone is the number of tax seasons you have worked. I can’t believe that I am about to embark on number 21. So let me tell you why I love this suit and why it works for me. First off, it is made of high quality, heavy weight stretch ponte fabric. This fabric is a dream as it provides structure but also stretch where you need it. It wears well and molds to your curves. Next there is the peplum silhouette which is a very feminine shape and great way to provide tailoring in a women’s jacket. It also has pleating details for some slightly extra volume and a bit of a flared hem that creates a unique effect, especially from the side. But in the end it is the details that pull it all together. I love that it is a true double breasted placket, the gold buttons add a real richness to the piece and the white trim brings that flare and sophistication that black and white does. And ELOQUII hit it ride on the head that it definitely has Jackie O vibes. The skirt is a classic straight silhouette, I appreciated that it isn’t as form fitting as ELOUII’s staple pencil skirt. And the length is perfect; it hits me just below my knee. The crisp white trim is the perfect finishing touch. I am wearing the 28 in both the jacket and skirt. I am really happy with the fit. I also appreciated that I could wear the jacket with nothing underneath or just pair it with a simple cami and show a bit of lace. If you are going to wear a power suit then of course you need the accessories to do it justice! So I pulled out all the stops for this one with some of my most coveted pieces from my collection. These shoes from JD Williams USA are one of my favourite pairs because they have a little bit of a retro feel and a heel that I can actually function in for a few hours. And there is something about patent leather that just adds that extra polish to a look. I then added these gold statement earrings from Aldo and a simple gold bracelet. I have to say these earrings are surprisingly light weight and I love that they have a bit of an industrial feel to them. The final pieces of the puzzle were my Celine bag and my sunnies. I can’t tell you how happy I am to have a true power suit back in my wardrobe and I can’t wait to rock this look at the office and make some head turns. Thank you ELOQUII for providing fashion forward options that continue to push the boundaries and make my wardrobe killer! You are knocking it out of the ballpark here! This suit was made for you. If it comes in other colors, get them. 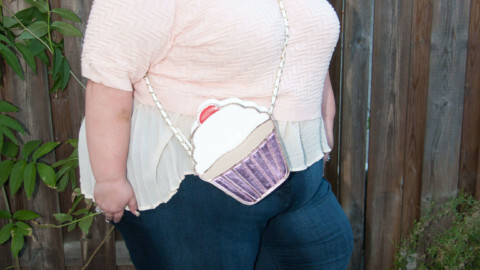 The handbag is perfect here. You are an inspiration. Wonderful pics and the jacket accentuates that you have a wonderful waist. You look like a successfull business lady. Black is always a great color to have in a wardrobe. always looks cool on anyone who wears it.